Enjoyed yesterday's dig - thanks for organising. How did everyone else get on? That's respectful day the cannon looks in great condition. Well done on getting some decent finds and the cannon is great! Best I could manage was a Viccy halfpenny and an Edward Vll farthing but it was good to be back out detecting after a prolonged absence. I managed to get the car bogged down on the way out so thanks to the two guys who gave me a shove which was greatly appreciated. Not a bad day ! Apart from the usual lead, buttons and other non-ferrous scrap etc managed just one coin - George lll farthing in poor condition but I enjoyed my day and the digging was very easy. Thanks Grant. 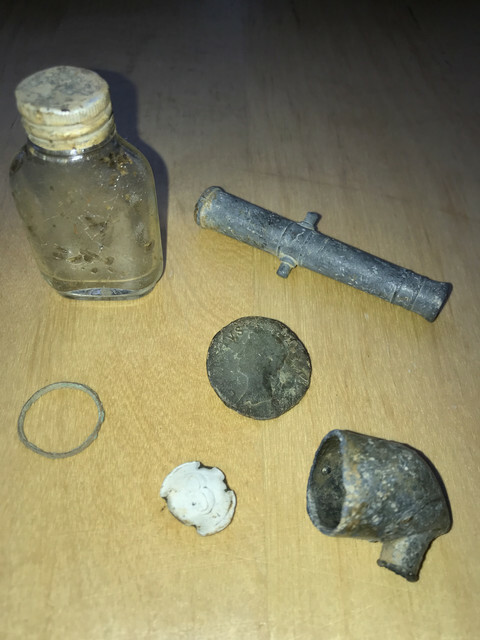 Forgot to say well done TimChilli, nice mix of finds.